We’d love your help. 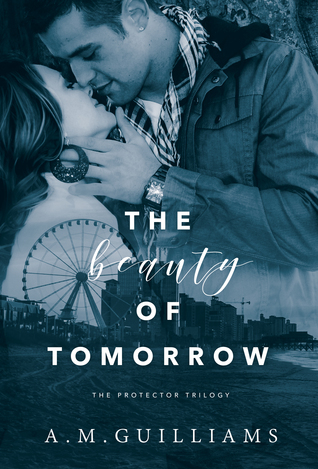 Let us know what’s wrong with this preview of The Beauty of Tomorrow by A.M. Guilliams. She looked to me for answers, but I had none to give. I couldn’t touch the case with a ten-foot pole. D She’s mine to protect. To ask other readers questions about The Beauty of Tomorrow, please sign up. Holy emotional roller coaster of a ride! This book hits you so hard with the feels and the angst because of the trauma that Ella went through. My heart shattered for her so much! But then there is Tucker. Oh my stars, Tucker will make you swoon and want one for yourself. I loved their connection even though they did not admit it to each other for a long time. When things happen to Ella, Tucker is the one to hold her up. He is the one to soothe her nightmares. I loved their banter and wit as well Holy emotional roller coaster of a ride! This book hits you so hard with the feels and the angst because of the trauma that Ella went through. My heart shattered for her so much! But then there is Tucker. Oh my stars, Tucker will make you swoon and want one for yourself. I loved their connection even though they did not admit it to each other for a long time. When things happen to Ella, Tucker is the one to hold her up. He is the one to soothe her nightmares. I loved their banter and wit as well. Though I did want to smack Ella’s brother, he did have some redeeming qualities. There are so many little twists and turns and the culmination ended with such a bang. I honestly could not blame Ella for how things ended but she came back fighting. Tucker just wanted her and to make her happy. He always says the right things and that will make you so swoon! Overall, this is an amazing story and once I started I could not put it down. I loved the concept and every moment of the book. I giggled but also broke with everything that happened. I am really looking forward to more in this series because I want to know more! I highly recommend it! The Beauty of Tomorrow by A.M. Guilliams was absolutely wonderful. As the reader you are sucked in within the first few pages. A.M. Guilliams has this way of writing that gets the reader into the story with all the emotions from the characters. I was on the edge of my seat reading this book wondering what would happen next. I seriously could picture myself in this book and felt what the characters were going through. Tucker and Ella's story is a journey that I highly recommend reading. With all The Beauty of Tomorrow by A.M. Guilliams was absolutely wonderful. As the reader you are sucked in within the first few pages. A.M. Guilliams has this way of writing that gets the reader into the story with all the emotions from the characters. I was on the edge of my seat reading this book wondering what would happen next. I seriously could picture myself in this book and felt what the characters were going through. Tucker and Ella's story is a journey that I highly recommend reading. With all the twist and turns and what is going to happen next, this book is a page turner. Trust me, you will not be able to put this book down. Holy Moly!!! That was one of your best books to date A.M. I had to force myself to put it down to get some sleep but I dreamed about it. I couldn't wait to wake up and finish reading it. I was kept on my toes. The emotions between the characters were felt straight to my soul. I felt my heart get ripped out. I didn't want it to end and I can't wait for The Pain of Yesterday. I need more of Tucker and Ella also. But I can't wait to read Alec's story. The Beauty of Tomorrow was absolutely outstanding! Within a few short pages I was mesmerized, and I read late into the night until my eyes were blurry. I just could not put this book down! Tucker was sweet, patient, kind, and caring. I liked him immediately. He was a rock for Ella, and I respected that that so much. Ella tugged at my heartstrings. I felt her pain, her frustration, and her fears as though they were my own. I was so worried and afraid for her! The plot was suspenseful and riveting. I was constantly on the edge of my seat waiting for the other shoe to drop. The ending had a couple of twists that I sort of foresaw, but I still felt surprised nonetheless. The Beauty of Tomorrow was my first book by A.M. Guilliams and is the first book in The Protector Trilogy. I can tell it will stick with me for a long time to come. I was blown away by the writing and anxiously await the next book.